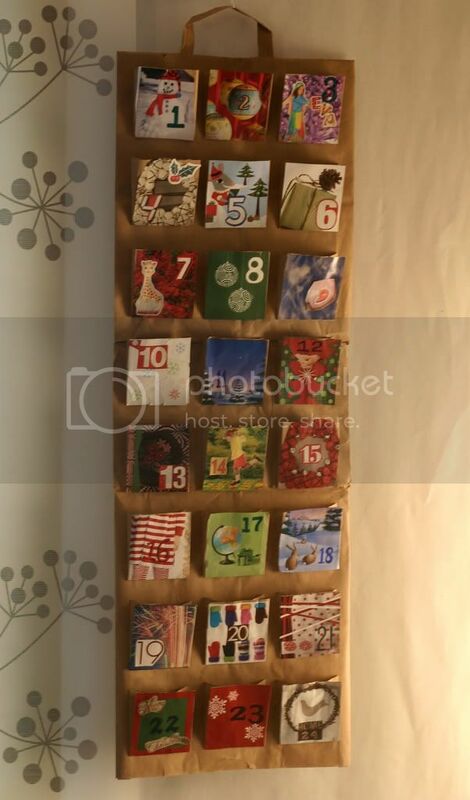 Last year, Amanda did a roundup of many Advent Calender ideas. Filled with photos and links, it is sure to get your creative juices flowing. Advent is one of the best ways to "put Christ back into Christmas", since it gets your attention regularly and makes devotional time fun for the kids. Some of us make it a daily habit to read the Bible and pray, but many of us find that time difficult to fit in. Advent gives a new start on centering thoughts around what is really important in one of the most hectic seasons of the year. And an advent calender that reminds you every day of something important about God's promises is one of the traditions I like best during the Christmas celebration time. This one is made out of paper bags. Such a fun collage idea, too. I could imagine just marking the square with the number of the day and having craft times making the collage bags to paste up for the week. If you save old Christmas Cards, or have leftovers form past years cards... this is one craft idea that would be easy to organize.